Are you basically healthy and interested in prevention? Or do you need long-term management of a chronic medical condition? Either way, or for any scenario in between, the CustomCare MD practice model can be a good fit for you. With far fewer patients than the typical internal medicine practice, our physicians have more time to provide their patients with personal attention and individualized plans to improve health. Patients are able to communicate directly with their personal physician in a relaxed, unhurried atmosphere. Each medical decision is made with the patient’s individual needs and concerns in mind. CustomerCare MD offers its patients more than just medical care – it cultivates positive, productive and long-lasting doctor-patient relationships. Your personal physician is available to you by telephone and e-mail any time of day or night, seven days a week. Should a visit to the emergency room or hospital be required, your physician will personally coordinate your care and visit you daily at the hospital. Both physicians are on the medical staff of University Hospitals of Cleveland. Most office visits are scheduled for 30-45 minutes, and complete physical exams are scheduled for at least 90 minutes to allow for a thorough personalized evaluation. Spaces are reserved in the schedule daily to accommodate same-day visits for urgent issues . We are committed to running on-time, so rarely, if ever, do our patients spend much time in the waiting room. This exam includes extensive screening of blood tests, urine tests, and (when necessary) cardiac and pulmonary testing. The baseline exam also allows ample time to focus on nutrition, exercise, weight management, stress management, sleep and other lifestyle issues that impact health. It is not necessary to travel to a lab for testing. Our nurse, Ann Corson, draws all blood tests and performs urinalysis in the office. Our physicians evaluate risk factors unique to each patient and provide customized screening for cancer, hypertension, heart disease, high cholesterol, diabetes, osteoporosis and depression. When necessary, our physicians will make house calls or meet patients after hours. Every effort is made to avoid referring patients to an emergency room when a medical issue can be safely and appropriately handled at home or in the office. As experienced physicians in the Cleveland community, our physicians will personally recommend the most appropriate specialist based on the patient’s clinical history. If specialty care is recommended, they will personally introduce the patient to the specialist by letter or telephone call. On occasion, our physicians will accompany the patient to the specialist visit to help facilitate the discussion. 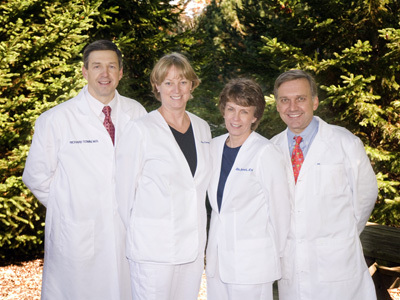 Our practice is located at University Suburban Health Center in South Euclid, Ohio (USHC). Most medical and surgical specialists, nutrition services, physical therapy, radiology, laboratory and outpatient surgery services are available at USHC. All immunizations required for foreign travel are included in the retainer fee. Our physicians are experienced in providing customized medical advice to foreign travelers, as well as administering all the necessary immunizations or medications required.